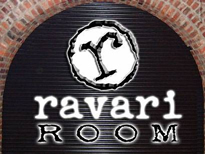 The Ravari Room is a 21+ bar and live music venue located at 2661 N. High St. Columbus, Ohio 43202, just north of the Ohio State University main campus. They are open 4pm until 2:30am 7 days a week. The bar does book a wide range of acts, not only locally, but nationally as well. One of the highlights of seeing a show at the Ravari Room, is the comfort of knowing that you can order HoundDogs pizza at any time during the evening. The renowned pizza shop is connected to the bar and has some delicious pepperoni pizza.